Do you work for Namely? Learning about Namely? We can help. "Namely is our intranet for the whole company"
"Namely has all the necessary functions for HR management in an Global organization "
Namely supports the built-in connection to NetSuite for synchronizing the Employee Profile, however it does not support the NetSuite custom fields, and it cannot be used because of that. "Namely - A Standout for All-in-One HRIS, Payroll, Benefits"
1) HRIS, Payroll, and Benefits Administration are synced!! 2) Namely looks like it belongs in 2018. The UX and design are very pleasant, a stark difference from the many other products that responded to our RFP. One year in with Namely, our multi-generational staff all have overwhelmingly positive feedback -- both for the design/UX and for having their important information in one place. There's some system quirks (as with everything) but nothing that's made me regret having chosen Namely. The Time Off functionality isn't as sophisticated as BambooHR (which we had before Namely), but it's completely workable. Get in-depth demos of other products in the market. Be specific with Namely about what other products you'd want to integrate with. Before, we had a separate HRIS, Payroll, and Benefits Admin - payroll premium deductions were a pain to keep synced and there were frequent mistakes. We had no 1 system of record for benefit elections. Having this all synced, we've realized the benefit of less maintenance. This is huge for us because we have a small HR team. 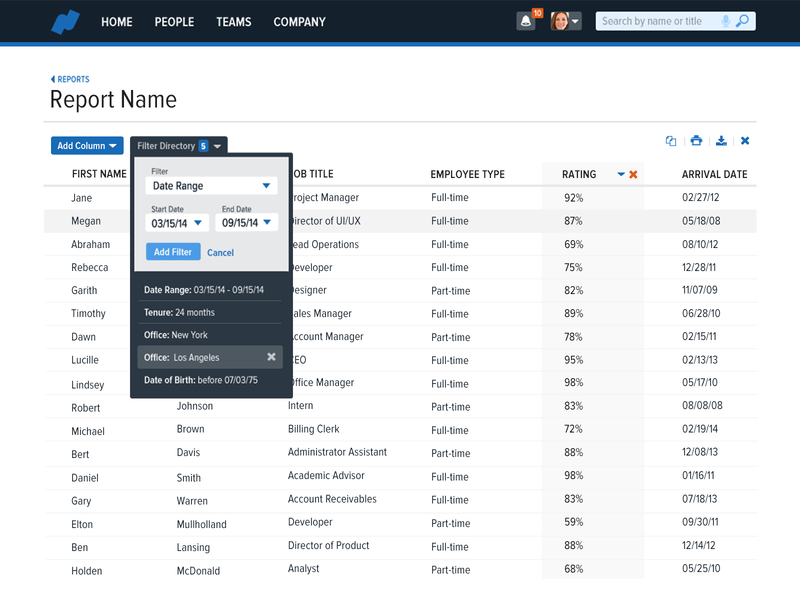 "Can't imagine using another HRIS"
The clean and easy-to-use interface helps me in onboarding, payroll, etc. and reduces the need to always work through software with employees (plus, there are training resources for basic tasks). The payroll module is straight-forward and easy to use - I spend minimal time running payroll, and if there is an issue, Namely is quick to respond. The customer service I've received has been top notch - we have one point of contact for HR/payroll and they help get answers when needed. We also use their benefits which helps simplify things as well (and great customer service there too!). No major complaints - sometimes there are very (very) specific features we're interested in - there's often work-arounds or it is on the list of potential adds. The performance management module is very customizable and is included - but still could use a little work to be on par with stand-alone performance management products (but is still an excellent product!). Too many disjointed modules. Horrible user interface. Too many mistakes and issues with benefits and products (on end of other HRIS/benefits). 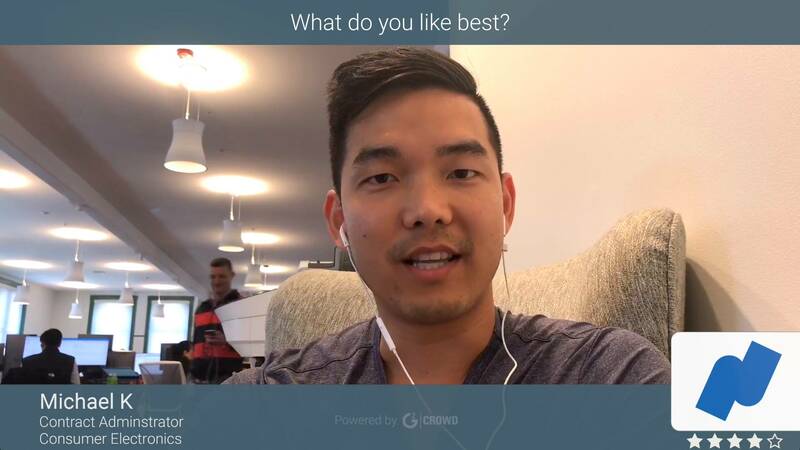 "Best all-in-one system for small/mid-size companies"
Aside from having every tool an HR/Payroll dept needs integrated and working together, the best part about Namely is their customer service. Each client has an individual client partner instead of an 800 number and a case ID. That's made all the difference - instead of going thru prompts and re-describing the problem to a different CSR each time you call in, your partner knows you and your company and always responds quickly. Outstanding customer focus! Nothing, they're exactly what we were looking for and more. If I were looking for a new system, I would implement Namely again. Stop wasting time comparing other systems, Namely is the best and is very competitively priced. They took on our benefits brokerage services in the middle of a renewal season when we were struggling with an unreliable broker we've had for years. They came in and negotiated down rates for us, set up new plans, working with our insurance carriers and got us everything ready in time for open enrollment. Unbelievable effort - Namely hires outstanding talent and their benefits team works wonders! "Impressive Platform but Rough Payroll Transition"
We just switched to Namely from Paycom. The platform is fantastic. I LOVE the mobile app for pay stubs and PTO approvals. We've switched payroll / HRIS four times over the past 18 years. Until now we've never experienced a problem with payroll not being transferred and setup properly. Our experience with Namely has not met expectations. We have had several issues. It has been difficult to manage and take significant time from our HR team. Not to mention that our 100 employees are not getting paid correctly. FRUSTRATING. Two things. 1) Make sure you understand payment terms. We were used to paying for our HRIS semi-monthly as part of our payroll. Namely wanted us to pay quite a bit in advance. 2) Don't trust that your data is setup properly. We were assured it was, but it was not. Our first payroll had dozens of errors. Payroll. PTO tracking. Employee workflow (promotions, raises, etc). Performance management. HRIS. Manager approvals. Benefits administration. Lots more. "Great HR Software - Everything in One!" The best thing I have found about Namely is the ability to track PTO, WFH Days, and the calendar function that shows all of that plus birthdays and anniversaries. It can sometimes be cumbersome to find the specific things I am looking for. It's not always clear under which category you will find something. Definitely use the Benefits Administration, it has saved us a considerable amount of time and headaches. We were having a very difficult time tracking time off, we didn't really have a procedure prior to adopting Namely. Employees would have to submit time via email to HR and it was not a great way to track. It has cut down significantly on time and accuracy. An employee can easily see how much time they have earned and how much they have taken. It has also SIGNIFICANTLY cut down on our time for benefits administration. The concept of everything working together - HRIS, Payroll and Benefits. I say concept because in March it will make it a year since implementation and we are still working out issues. The lack of training their personnel has from implementation to the service center. Their management does not follow up when issues occur either. FYI: A normal task that any other payroll provider does they do not: they do not print the W-2s or 1095s, the client has to print and distribute. I would advise a person with more than 5 years of experience and has their CPP should handle the implementation because I can see a ton of things falling through the cracks such new hire reporting, group term life taxable income, child support and much more. Not sure I can say I would. Namely, can assist w/the administration of the benefits, using the carrier feeds, which is very beneficial for a one person team -HR/Benefit/Payroll department. On-boarding is very useful as well as long as everything is working. "Rapidly climbing the ranks to be one of the top HRIS systems on the market." Namely has done a great job of prioritizing user experience by designing an interface that is familiar and intuitive to anyone who has ever had a Facebook profile. I also need to give a shout-out to the amazingly responsive and dedicated support team who is always there to answer my many questions. I'm truly impressed with the freakishly fast response time of our Support Lead, Nathan Zajonskowski, from Namely's Client Success team. Nathan - I'd be lost without you! There are still some minor tweaks needed here and there to further refine the UX. At the moment there are some areas of the system that aren't fully automated so I'm glad that the Namely Product team is sweating every pixel and constantly working to improve the existing platform by continuing to iterate and roll out improvements every quarter. Don't be afraid to ask questions and really dive in. The more you know about the system, the more you will love it. Namely's highly configurable platform has made adding new office locations across the US a breeze. "Great HRIS, easy to use and always improving their software"
Namely keeps all of our HRIS, Payroll, Benefits, and time off in one place. It is easy to use and configurable to fit the needs of your company. They are always open to feedback and improving the software. I would like to see more customization on the file storage/uploading documents so that we can store personnel files electronically. It would also be nice to export org charts. Onboarding is a little clunky and it would be nice to have the esignature feature for current employees. I wish it would integrate with our compensation software. Ask for references so you can ask questions and possibly see Namely and how another company is utilizing it. Make sure to ask them about Implementation, it is definitely more time consuming than we initially thought it was going to be and ended up pushing our "go live" date back. We were able to move our Benefits Open Enrollment to a completely electronic process which has saved us a lot of time. We now also store all of our HR policies, some employee documents, and have created some workflows that used to be a paper process which has allowed us to become almost completely paperless. Overall, the Facebook-like feed is intuitive and the overall design (albeit simple) is effective. The UI within specific modules or applications are not very strong. 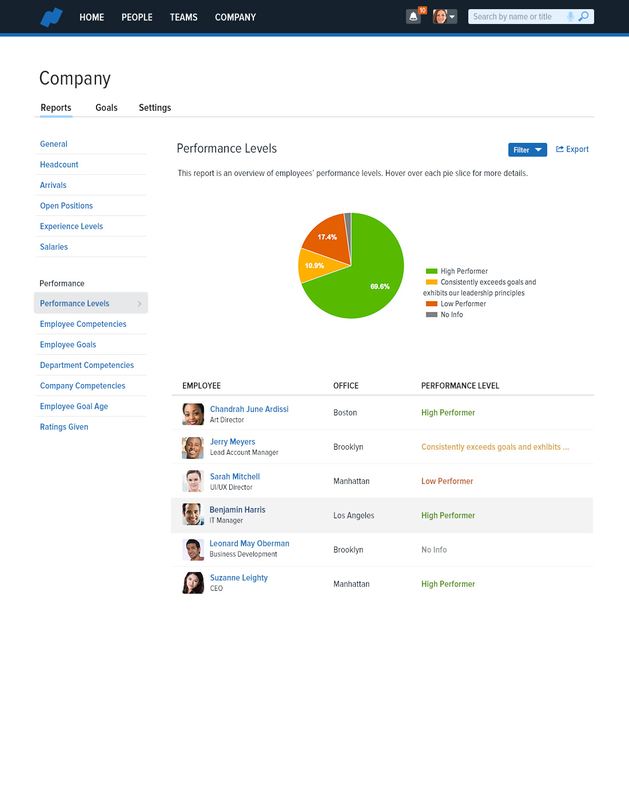 The performance management module is particular is difficult to use and provides some UI challenges. For example, I worked on a review and clicked Submit Signatures. I wanted to edit the review so I clicked "Amend Review." I made some updates to the review. I had the review with the reviewee but he could not see my comments (I had the setting "xxxx" set so he can view comments. From the reviewee POV, the status said that "the review has not been submitted." The only way he could see my responses was for me to "Send for Signatures." I think there is a bug in the system that when I amend the review it think I am still working on it. I hope there is a way to fix this. Namely has some strengths (Google Authentication, consolidation of several tools into one platform, etc.) but the applications need work. Namely is a great tool to have in any organization. It will help your operation cost and streamline HR processes. I enjoyed the dashboard, all important information is easy to access and the messaging function is an easy way to communicate with HR or Namely Admin. When I had to do revisions to my benefits it was a hurdle, I had to wait on our Admin to update my profile. But as soon as it was updated, doing the revisiions was easy. I do not have any current recommendations. I like the tool and features. Namely has helped our organization streamline HR process and easy for our employees to access their tax documents, benefits, PTO requests and etc. I have heard more positive responses from our members than negative ones. "Easy to use, comprehensive HRIS"
Namely offers a completely centralised HRIS platform, which is essential for multi-location businesses. We run operations in Canada, the US and Europe, so we placed a lot of emphasis on making sure our HRIS could provide a consistent experience to all our employees. This goes a long way to making all employees feel part of the same company, irrespective of their location. Some of the small features are great, like pictures of employee profiles and the central news fees. We recently used the performance function to complete a company-wide performance evaluation process, including 360s, which was extremely easy to manage and administer. The time off function was also extremely easily for our employees and managers to pick up. There are some limitations, such as certain payroll and time sheet functionality restricted to the US due to payroll. Also, Namely doesn't offer payroll services in Europe or Canada. As a centralised HR department, we needed a single pane of glass view across the business, and Namely provides that. We have access to comprehensive reporting, real time information on key HR and business metrics. Great software solution for small to mid-size businesses. Easy to use out of the "box" but can be customized to needs of the business. One of the best benefits administration enrollment processes I've seen and easy to use payroll. Quick to implement and a level of transparency on what is coming next to the software platform is above and beyond what I've seen in the past. Still working on fully integrating the HR and Payroll side of the platform. We no longer have to have a full-time payroll headcount. We are able to reorganize and add professional HR talent versus spending our time on a process that we don't need to have extensive knowledge in. This is a good simple HR tool. Once you figure out how to add employees to their managers it is pretty smooth sailing. You can set up notifications for when employees want to use PTO. This doesn't integrate into Salesforce. The hierarchy of how you relate employees to managers is a little funky once you have more than one person in an approval process. Simple to use and setup but fairly limited on customization. Doesn't integrate to Salesforce. It's simple enough to use that our less tech savvy employees have figured it out. "Namely - simple for end users but lacking horsepower for HR"
Functionality is simple. UI is pretty clean. Most of the major functions of HCM are present. As an end user, the interface can be cumbersome to navigate. The mobile app is nowhere near a complete representation of the full solution - PTO and employee directory is about all you get. In many areas, functionality is not deep so we had to make some sacrifices in our process, along with manual efforts, to make it work for us. Reporting is bare bones. Be prepared to invest time and effort during implementation. Regardless of how "easy" the sales team will convince you it is to get Namely up and running, it is a significant project, especially on the payroll side. Centralize HR processes and create a true system of record for HR. "Namely meets a variety of needs"
We use Namely for various aspects of HR: onboarding, performance review, time off, benefits administration, and payroll. Having these functions in one system is very helpful. The Namely support team is responsive to issues. The company has grown since we signed on with them in 2015, and they have provided excellent service. Not much to dislike. We have had turnover in our main rep, as Namely has grown through the years. Also, open enrollment requires significant effort by Namely to run each year. "A start-up employee view of Namely"
Simple to use website. UI & UX are both pretty on point. Not sure if they have a mobile but I think it would be a good addition. One of the feature we use is to keep track of people's birthday's & work anniversary. It's pretty easy to send someone a message to congratulate them or just say Happy Birthday. Org chart is also a useful tool to see who works for who. As our company grew it was hard to keep track and after having namely around it was much easier to find the right person for the right job. I guess this isn't a dislike but I would've like if our company made use of the work flow function and task function. The sign in process can be a little confusing at first. You can't just go to namely.com, sign in and do your thing. You have use "company name.namely.com" I thought it was just an extra step that was not needed. Benefit forms can be a little hard to find; for example, I needed a gym reimbursement form and it was hidden to far in the benefit tab. Overall, it's nice terrible, just a few minor changes. remember you website address for sign in. As state earlier, it supported the basic needs of a growing company. Especially for the cost, there were many other softwares but namely was pretty well priced compared to everyone else on the market. "As an HRIS Namely is as good as it gets." After using many other platforms in the past, I can say that Namely provides an easy to use platform that works out of the box but offers a great deal of customization to fit your workflows. They are constantly releasing new features and improvements that are visible and useful with a support staff that is always ready to help. Integration between payroll and HRIS is a work in progress that still needs work. I am confident they will continue to improve it moving forward. 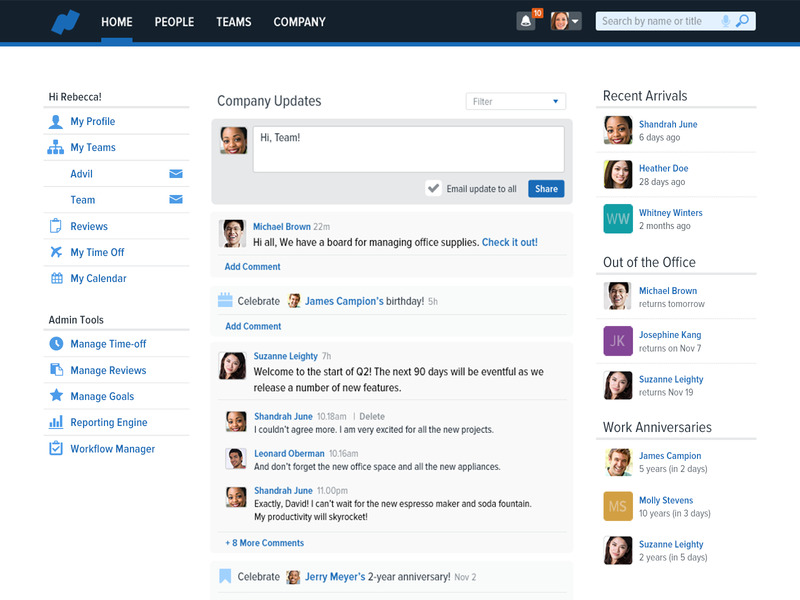 "Nice Software for HR Related Capabilities"
The ability to quickly find fellow coworkers and their relevant information. It's a nice system that makes it easy to find all of your personal files, especially the ability to gather your tax information quickly. 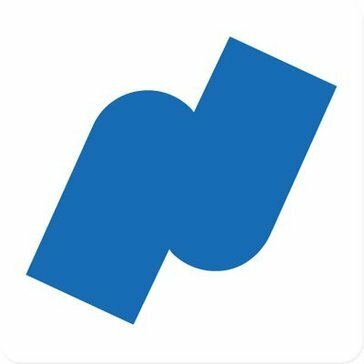 You can view your paycheck via the platform as well. There used to be a feature where you could quickly see a snapshot of what your vacation time looked like. The feature seems to be removed, and I really enjoyed using it in the past. It's definitely recommended because of it's HR capabilities. It seems to have made our HR teams job much easier. They are able to quickly pull up information related to our employment when we need access to information. It definitely makes things much easier. The option to have all of your HR information in one profile. Also, the ability to see information about your coworkers. "A Better Way to HR"
As a new employee, coming to a company with Namely was really nice. I was able to do all sorts of HR and onboarding online and at my convenience. I was also able to log in and see an Org chart and know "who's who" before I even started on my first day. It's also nice to have pay stubs, benefit information, etc., all in one spot that I can log into with Google SSO. I think Namely is incredibly easy to use, but I think it's more powerful the more that employees use it. So my only complaint is that "it's as good as you make it". If your employees don't fill out their profiles, for example, then your company directory isn't very strong. Since I'm only an end-user, I don't have any advice in terms of configuration or setup. I would recommend that you have new employees try it out. We use Namely for all sorts of employee onboarding, a company directory, payroll tracking, PTO/time-off requests/tracking, benefits signup and logging. It has made a lot of HR tasks a lot easier. Review management works pretty well. Managing time off also works pretty well once you get it set up correctly. Their service is absolutely horrific. Based on the number of payroll and benefits mistakes they have made in the last year, I can only assume that everything they say is automatic is actually done manually. We have an HR person who has to double check almost everything that happens in Namely related to benefits and payroll. If she hadn't been paying careful attention, we would have fallen out of COBRA compliance on several occasions. They have also made a few entirely avoidable mistakes that cost us money - withholding incorrectly based on benefit elections, not properly funding HSAs but withholding the funds etc. I would only recommend Namely if you have a few extra HR folks who love micromanaging and have absolutely nothing better to do. Hire an HR person to babysit Namely and be prepared for Namely mistakes to cost your company money. We initially needed a system to track PTO and Sick Leave as well as something to manage health insurance benefits. We were also interested in updating our payroll processor to a system that would provide better employee access. Benefits: We now have a system to manage PTO and Sick Leave. Health insurance is partially managed - their open enrollment system had to be turned off multiple times during our open enrollment period this year and we have had to double and triple check everything they do - never trust a confirmation page in Namely. Payroll is processed by Namely - once again, you need to double and triple check everything they do because your pay stub may not perfectly match reality unless you ask them. "Big Issue for Big company"
Very simple to use and great interaction work social media feature to help employees connect with each other. Very unprofessional when it came to handling the more important things, like payroll and benifits. It might work better for a small company with maybe less than 60 people or so, but I wouldn't recommend for more than that. We went from ADP to this company to I guess have a change. So this was our main and only HR software system. The only benefits I see is that it does have a nice social media feed screen, but that's about it. The ability to customize the system and tailor it to our unique culture. It's the one stop shop for all things employee related. It's really a great tool for organizations who have advanced people processes. Namely listens to product feedback and is always looking to make their tool more robust. We used to have different systems for different things (HR, Payroll, PTO) and it was confusing to employees. Namely has put everything in one place and helps us automate our people processes. "Line up your People Tech problems, Namely mows them down. " We use Namely for both our for-profit and non-profit organizations. From the beginning, Namely erased most of our organizational "pain points". After just two years, we use Namely as our go-to people forum. We share news, goals, events. We pay our people through Namely. We have a window into our company strategy and operating plan because Namely makes it easy for us to share our vision, mission, values and strategies with our employees. Namely has become our single version of truth for employees. Wish invoices were a little less confusing. Would love to have a traditional org chart option for old-school types. Talk to current users. We interviewed so many before we made the switch. Very effective for the change averse CFO. Seriously, there are too many benefits to name. Highlights: one stop for all people needs. Visibility to strategy, goals, news. On-boarding and compliance are so simple and PAPERLESS. Performance reviews can be tailored to any need, team, or situation. "New Remote Company - Taken to Another Level"
Namely's support team is always available to help. They are always friendly, professional, and helpful. They anticipate needs and provide excellent resources and tools. That I don't have time to learn all of the ways to use it! Ask to speak with someone with a similar business structure who is using Namely. Be prepared with specific questions. Make sure they are using all of the features you have questions about. Internal communication w/ remote employees, organization, and company culture. It's helped us increase ee education about their benefits and better utilize them. It's great - you can see all of the other employees at your company, who their bosses are, when everyone is on vacation, when work anniversaries are, you can "appreciate" your coworkers, and more. I really like how user-friendly everything is. I wish you could edit your vacation time. I needed to shorten or adjust my vacation time a couple of times, but I had to delete and resubmit. I mainly say this because I have to take some extra steps like recheck what the vacation days are. It's very minor - it does not impact how I view Namely. We needed something that was user-friendly and had a lot of features. "Pretty good system for employee management. " The "social media" feel of the system and ease of navigating the home page. Also like the ability of employees to post to the main feed and how managers can tag employees for recognition. Onboarding process flows fairly easy and is a huge step up from the manual process we had before. A good system but takes time to learn. There are guides online for how to do things but it is not always easy to find the exact topic you are looking for. Going from manual tracking of employee data, this is definitely a step up. Saves time and allows us to run reports much quicker than before. "Namely: A great HR portal for a distributed team"
Namely has a simple interface that makes tracking evaluations, pay stubs, tax information, and employee history a lot easier than other systems. We don't really use Namely to communicate (we opt for Slack), but if it offered a more delightful chat function or another format for communication, it would be an improvement on the simplistic chat currently used. This isn't a high priority, though, given Namely's primary functions. Namely is really easy to use; don't be afraid to customize where possible and make it your own! Keeping track of employee documents and providing an easy window into our HR functions for new staff. Namely has made annual benefit election really easy and we've made Namely the primary source for biannual reviews rather than using loads of Google documents. Namely combines the three main systems together - HRIS, payroll, benefits. Anyone who has had to deal with payroll mistakes or benefits mistakes can understand the value of having a system that's totally integrated. We went from having at least 2-4 employee issues (incorrect deductions usually) EVERY payday to none. Namely has truly been great at having zero errors on payday. I also really appreciate how fast our account manager and our benefits team are with responding to our questions. I wish the onboarding was better - we came from another system that had this down perfectly. It's a bit cumbersome in Namely. Namely is completely customizable though so I was able to figure out a work around easily. I just wish it was as perfect as the rest of the platform. I also wish the completed workflows were searchable instead of having to shuffle through the whole list to find something. Implementation is easy if you're coming off another HRIS - you just feed them your excel data and they take care of the rest. I would recommend figuring out how you want your workflows to be set up and working with your account manager during implementation to set this up. I wouldn't wait until after implementation or after your employees are used to using the system. Just make it part of your orientation to Namely. The main issue we had was the lack of uniformity and oversight - with namely workflows we're able to get managers across ten locations in two states follow the exact same simple procedures for requesting raises, terms, hires, department changes, etc etc etc. Plus it's all recorded and documented easily. "You want it, they got it!" Namely has been able to suit our needs in numerous ways, but the benefit piece and performance reviews have really brought us to a new level! With the benefit wizard our colleagues are able to smoothly choose their elections and the feed is sent directly to our carriers. This is much less intimidating than stacks of paperwork. Not only have our lives been made easier with the benefit tool, the performance platform has helped us create multiple types of reviews from annual, quarterly and 360 with a few clicks! As Namely is still very new and robust, there are some short comings I've run into in different areas of the platform. With this, Namely has been able to support any issues with their great customer service. They are very open to new ideas or any feedback on how to make their tool better, take advantage of that! During implementation be very specific with integrations and expectations of the tool. Also take time during implementation to really learn the system ,in and out. This will help you in the future when navigating through the system and assisting colleagues. Namely gives everyone a centralized system as a go to. Colleagues are able to see who is in what department and what their job title is. Also, colleagues are able to view their own information or request changes, such as address change and with a work flow, everyone in the company that needs to know of the address change will be notified. This helps minimize error and emails. It has also been able to support our reporting needs and has just been overall useful. "Easy to Customize and Getting More Intuitive by the Day"
We've been able to use the system to replace other systems we weren't thrilled with including payroll, benefits admin/HRIS, performance management, and time tracking. Overall, everyone from employees to our C-Suite is seeing the benefit of the system. Time tracking, time-off tracking, reporting...it's all easier than it used to be and because it is a single system of record, inspires confidence that we're all looking at the same thing. My company has loved the ease of reporting - add a field, drag and drop to adjust order, etc. It's also been great customizing the profile to meet our needs and knowing those customized fields are reportable. I am currently loving the task lists as well, as I can notify my colleagues in other departments of HR changes they need to make (onboarding/offboarding/title changes, etc.) and track their progress in one system. Finally, and potentially most notably, is the ease of using the payroll solution. We went from a process that took hours to 20 minutes to run two payrolls. It is simple and intuitive to change deductions, pay, etc. The search for employees function is a little wonky and the system can require more clicks than seems necessary (needing to search, then a screen loads, and then click a name, and then click compensation or whatever area you want). We also have some complex team structures that are difficult to reflect in the system when it comes to goal setting and performance management. For instance, we utilize several cross-functional teams, and in doing so, we are prevented from having their goals easily cascade without the creation of custom teams that constantly require supervision. Finally, because we collect named 360 feedback but deliver it anonymously, we have to export the feedback, remove it from the review, and submit it - the full review does NOT exist in the system. Don't be afraid to ask for a calendar when you're onboarding. The trainings and timeline can get away from you and you'll find yourself two weeks away from go-live with an unexpected workload of training/implementing. I've given this feedback to Namely with the head of a project team working on making implementation easier and am confident the process will improve. As a startup, we move EXTREMELY fast and having multiple systems was not working. This has kept us all on the same page and made things simpler than ever. "Easy to use, but non-engaging"
- Like the ability to book off holidays and sick days to be sent for approval, easy way to track how many days you've taken off. - Aside from basic HR management, performance reviews etc. there's not much new or exciting here. Really depends one what you want - could be worth looking for a platform that drives engagement a little more. Generally fits basic HR needs. 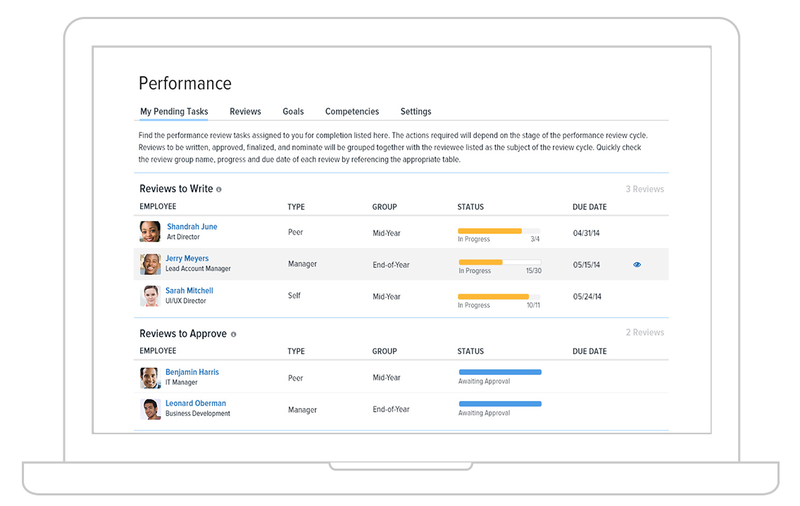 - Consolidated onboarding and HR management platform - keep employee info all in the same place. I love the ease of use when using Namely. It is very easy to learn and start working on. Wether it is viewing your payroll reports or requesting time off. It allows you to quickly see org charts and know who you might need to reach out to in different situations. I can't really say anything bad about Namely. Overall its been an enjoyable experience and there hasn't been any bad run ins with it. I recommend using Namely and can't find anything I dislike at this time with the product. Very easy to use. Streamlines process and gives you easy access to payroll, hr, and benefits. 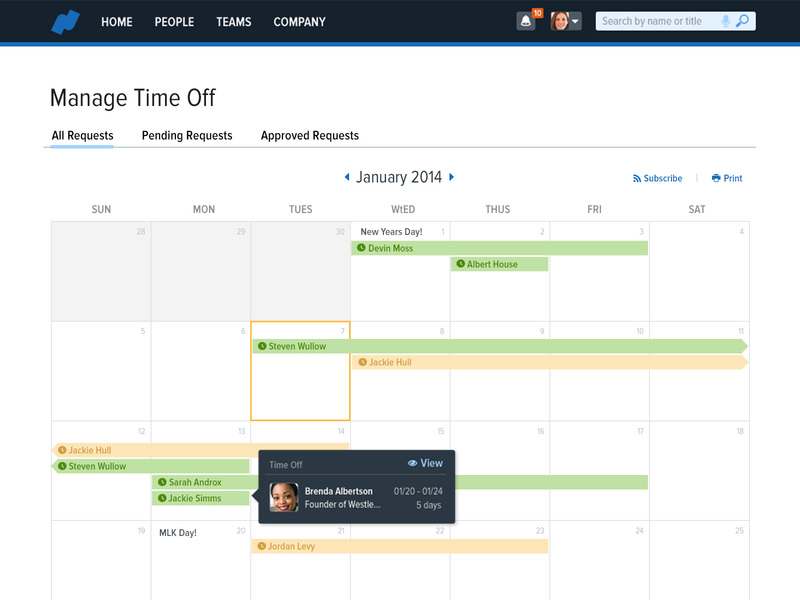 Namely allows me to request PTO, view my paycheck, review the company org chart and see how our company is organized. Allows me to access information with ease. Namely provides the functionality we need and partners with you on solutions versus just telling you "we can't do that." Their open API capability has allowed us to integrate our other system solutions; and, the user experience on the admin and employee side is excellent. Not all platforms are going to be 100 percent perfect. We don't use the Time and Attendance feature b/c our time is tied to our finance and accounting system, but we've been able to pull PTO used into the Time Off feature which Namely uploads for us. We wish we could keep/see time requested in previous year while still tracking current year. Totally minor and really doesn't affect anything; just a nice-to-have. Really, we have no complaints about Namely. Providing a platform for our one true source of employee data. Their open API capability has allowed us to integrate / pull data into other applications and systems within our organization's information technology ecosystem. "Namely-my new favorite HRIS "
Very user friendly, easy to use and creates a platform for employees to engage with each other. The esignature integration through Adobe is great but unfortunately, the I-9 form doesn't work half the time, specific I know, but that is my only gripe. We switched from ADP and we are seeing a huge increase in employee engagement. People actually want to sign in to see what is up on the feed. "New Company - Great Potential"
Very easy to use system for Employees, Managers, and Administrators. Always making improvements and listening to client feedback. Everyone is super friendly and committed to the product. Newer so some features you would get with another HRIS might be missing. Payroll, Benefits, Time, and HRIS all in one has made our life so much easier. Performance reviews and manager self service has been a life saver for our managers compared to old ways. "Namely provides a fun HR interface for growing companies"
I love how Namely makes it easy to see new employees, current department makeup, and additional details about individuals similar to a social media account. This personal detail helps coworkers get to know each other, and perhaps feel more comfortable approaching a new person, encouraging a team environment. Unfortunately, Namely was pretty light on benefits management, and other payroll tools, so the company moved to ADP. The Facebook-like interface may be good for some smaller companies, though fast growing, or already large companies may not get all the tools they need from this software. Namely is a great way to keep employees engaged with each other, though you may want to consider supplementing it with more robust HR management tools for benefits and payroll purposes. The company used Namely for employee management, and I personally used it to get to know my coworkers, and new hires. I really like that I am able to easily search my companies employee directory. This is one feature in particular that I use on a weekly basis. It is very helpful to see someone's position, location, and history with the company. It gives a very personal feel to bigger companies where you may not get to know everyone directly. Namely has a payroll feature that requires a different sign in then through namely only. This can be confusing and navigating between two different sites can be annoying. Namely helps us foster company culture with having one great place to view employees. It also shows anniversaries, birthdays, and new arrivals which is a really nice feature! My favorite thing about Namely is how easy it is to use. From onbarding, payroll, setting up time off plans, enrolling in benefits, everything is easy to use and there are extensive training materials to help you get the most of out the software. I love everything about Namely. The one thing I would like to see improved is the calendar since it is a tool that I feel could be more useful it it were more customizable. Take advantage of the training materials and webinars available. Namely is great solution for keeping organized and updated employee files. Employees are able to access their HR information whenever they need to and are able to make changes to benefits and payroll deductions easily.